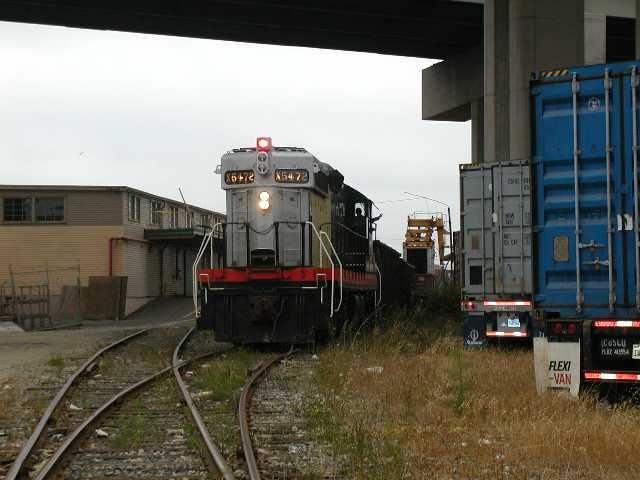 Wednesday was a very interesting day on the Oakland Terminal Railway. 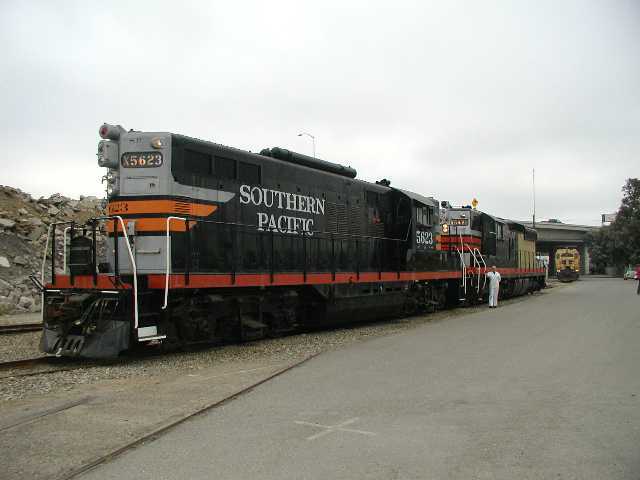 For the first time in the 63 year history of the company, a 6 axle locomotive was in switching service. Yes, it was our 6 axle SD9, 5472. 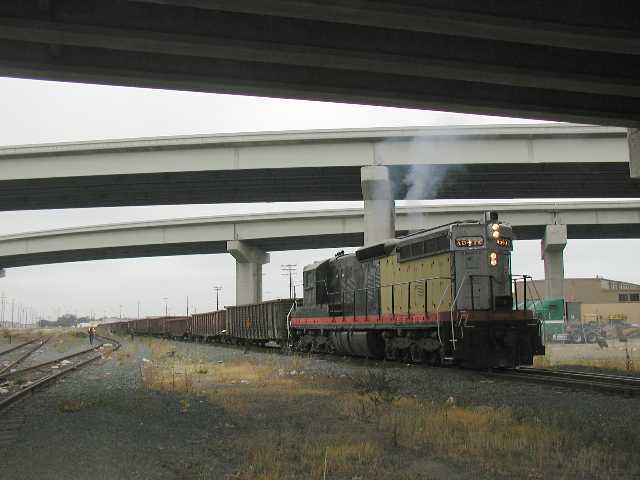 With the cooperation of our Superintendent and crew, our locomotive did all of the switching in Knight yard and then turned the train over to GP9 5623 for the trip over our bridge which unfortunately, has a rating less than the weight of the 5472. I was extremely pleased with the way the 5472 ran and discovered only a few new oil leaks after the adventure. 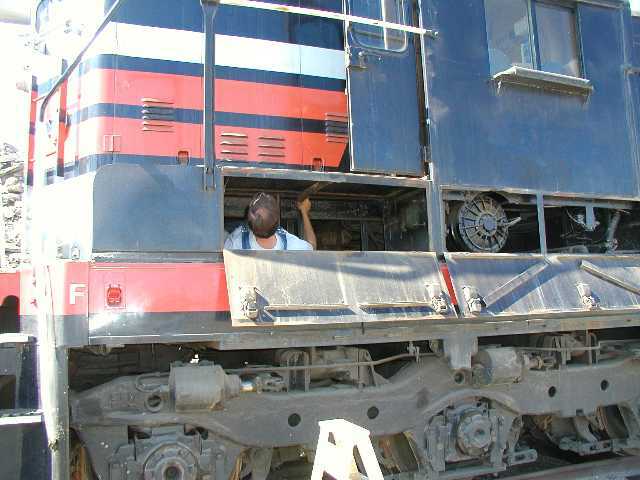 In the first photo, renowned PLA wordsmith and Ballastero supreme Steve Jones, who came by for his first ride on a big locomotive, is just about to climb aboard. In the second, you will note the illuminated red Mars light, a sure sign that the switchman dumped the air. There are no secrets with those red lights around. 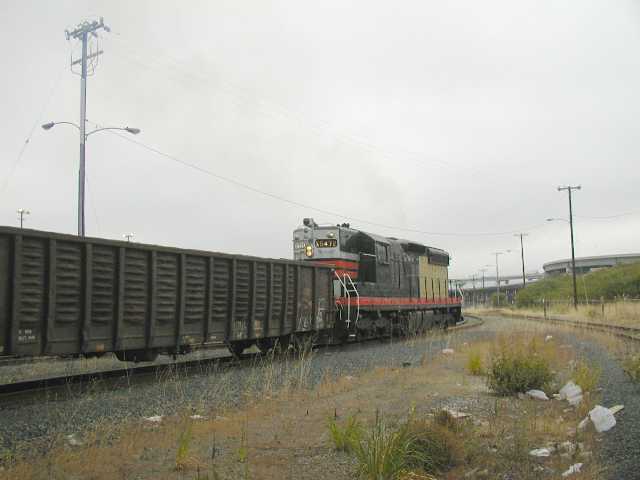 In the last 2 photos, the 5472 is pulling in run 5 or 6 and really accelerating the cut of gondolas which were loaded with scrap steel. 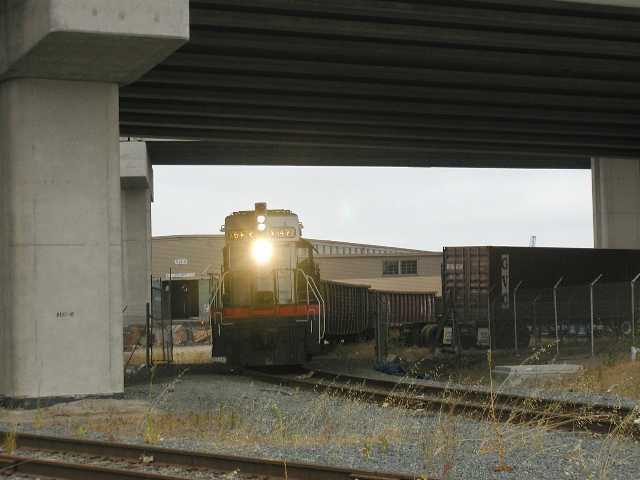 Our engineer said that it felt like a good, powerful locomotive and it sure sounded like it from ground level. This is not to say that there is not a lot of work to do to it but, we now know that it has a strong heart. Click on any thumbnail for a larger image. Use your browser's "back" button to get back here. Alan Siegwarth came down on Saturday and was put to work chasing air leaks. How a guy that tall can get under the cab floor is beyond me but he did and he got out too. He was somewhat dirtier for the trip but he did find the source of one leak that has been bugging us. 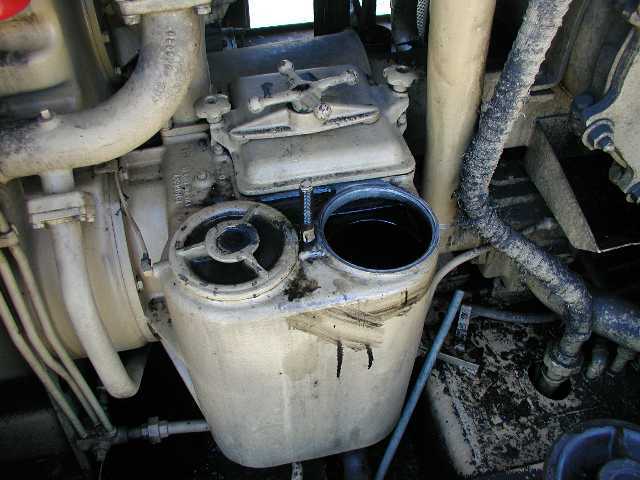 I took on the oil leaks that I noticed when we used the 5472 on Wednesday. One of them was in the sight glass shown in photo 2. 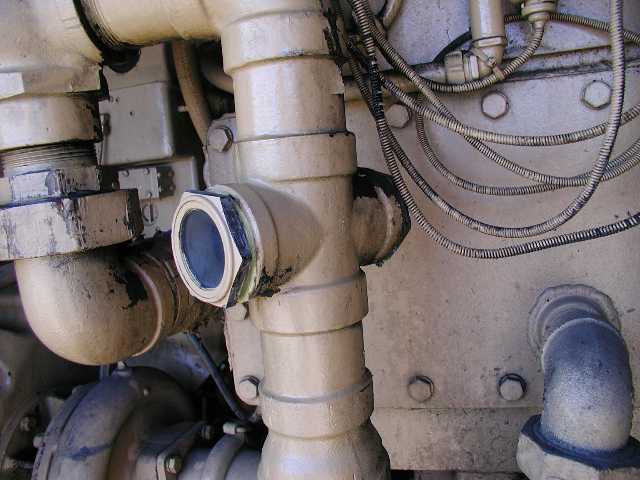 This glass is in the lubricating oil pressure relief valve return line. Some cleaning and pipe dope took care of that. 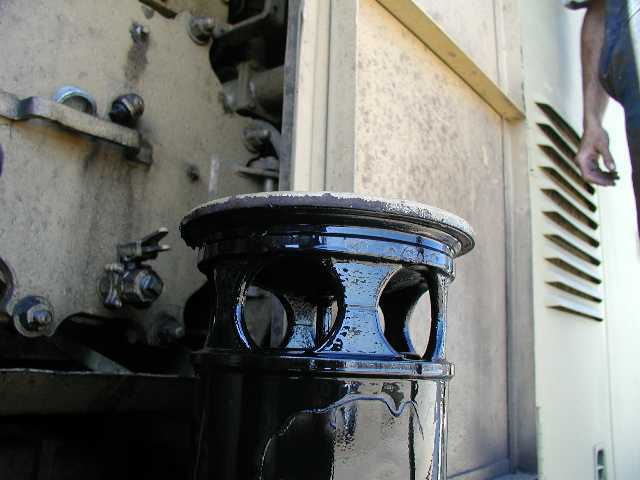 The other leak was in the engine oil pressure housing, sometimes called the "ice cream freezer". There are 3 filters in here, 1 for the suction system and 2 for the pressure pump. The 2 round pressure filters are sealed with an "O" ring at the top and the rings were just old and tired. New rings took care of this problem. 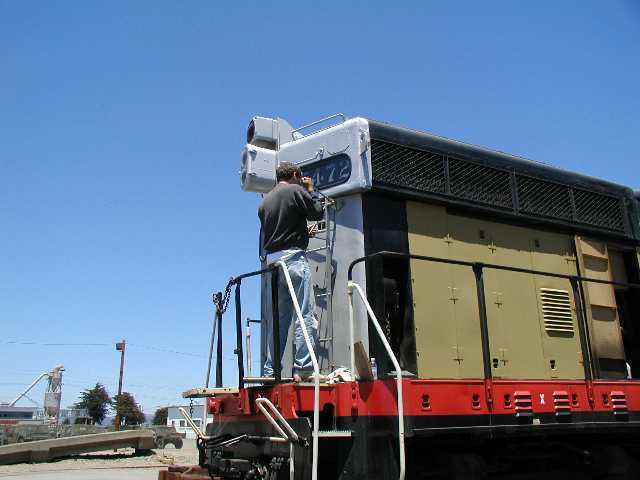 Another visitor was Dennis Mann who found himself removing one of the long hood end ladders and starting the process of paint removal. We are going to repaint the silver on this end before applying any of the black on the sides. All in all, Saturday was a good, productive day with a welcome number of visitors to the work force.